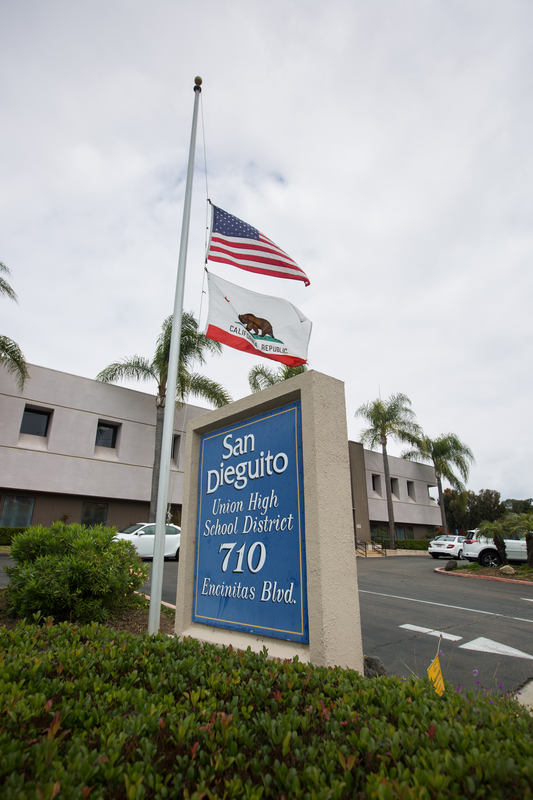 Requests for large donations are par for the course at San Dieguito Union High School District, which faces a projected $8.3 million deficit this school year over its $134.6 million general fund revenues. The district will have tough questions to ask when the board reconvenes on June 21 to approve next year’s budget. SDUHSD anticipates deficits of $4.4 million and $3.5 million for the next two respective school years and foresees a surplus of only about $271,000 for 2020-2021. The district’s reserves, akin to a rainy-day fund, stood around 20 percent just two years ago — an impressive savings. According to a district report, SDUHSD expects to finish the year with 10.8 percent reserves and the 2020-2021 year with 6.6 percent reserves. Board member John Salazar is concerned by what he calls “fiscal mismanagement at its most basic level.” He attributes the deficit to the teacher raises, which he did not vote for, of 12.5 percent in 2015 and 0.5 percent in 2017. The district has the highest teacher salaries by far in San Diego County. According to a report on certificated salaries issued by the California Department of Education’s School Fiscal Services Division, the lowest teacher salary offered at SDUHSD last year was $61,449. Nearby school district San Marcos Unified’s minimum salary, by contrast, was $37,922. The second-highest minimum salary offered by a San Diego County school district was La Mesa-Spring Valley Elementary’s $54,678. That’s still almost $7,000 less than SDUHSD’s lowest-tier compensation. The vast majority of county schools reported starting salaries in the $40,000s. In addition, SDUHSD’s average teacher salary of $103,417 was the only six-figure one of any district in San Diego County. She further stated in her email, “Our reserves have also been diminished by years of reduced state funding.” Hergesheimer said the board will continue to seek savings “wherever possible,” including cutting back on utilities by using more solar energy and applying carryover funds to bolster the year-end balance. Superintendent Eric Dill expressed frustration with what he sees as a lack of adequate per-student funding from California. “The most prosperous state in the wealthiest nation in the world should not settle for below-average investment in our students,” he wrote. As for Dill’s plan to get SDUHSD back in the black (surplus), he pointed to “holding our staffing wherever possible and capturing savings from retirements when we hire newer employees at a lower salary range.” He also said the district would continue to seek ways to become more efficient in its operations and that its budgets are “worst-case scenarios” that tend to improve by the end of the year. The board has also been generous with its administrator pay. The superintendent salary is $235,400, while four associate superintendents are each paid $196,443. Those amounts do not include benefit costs, which are substantial. All told, salaries and benefits comprise 84 percent of the district’s spending, which is not an unusually high percentage for school districts. But when one factors in the high salary rates, that 84 percent presents a funding allocation that could be hard to sustain. Only 4 percent of the budget goes toward books and supplies. Should district prioritize reducing class sizes? A Torrey Pines parent who wished to remain anonymous due to hateful comments directed at Wendy Gumb, the parent who has petitioned for a recall election of board member Joyce Dalessandro, has many misgivings about her child’s high school. First of all, she believes that the class sizes are too big. According to California Department of Education data, the average class size for the district for the 2016-2017 school year was 31.7. The county average was 24.9 and the state average 23.9. In perusing the current class schedule for SDUHSD high schools, it was not uncommon to find more than 40 students in English, math, biology, Spanish and Advanced Placement classes. Some P.E. classes had 55 students enrolled. Canyon Crest Academy’s average social science class last year contained 37 students. “How do students feel a sense of community at school when they’re educated in a sardine can?” the upset parent asked. Making class sizes smaller does not come cheaply. As Hergesheimer put it, “It costs our district about $1 million per year in increased staffing costs to reduce class sizes by one student throughout the district.” Another estimate was $1.375 million. The district-wide ratio of school counselors to students is 1 to 482. There are four social workers for SDUHSD’s 13,000 students. The concerned Torrey Pines parent believes that for all the money being spent on personnel, SDUHSD is coming up short on its responsibility to serve its students first. She’d like to instead see money allocated to smaller classes and the hiring of more counselors. According to a Healthy Kids Survey administered in 2017, about one-third of students at the district’s high schools reported not feeling like a part of their school or being unsure about that status. Furthermore, 38 percent of female and 21 percent of male high school students at SDUHSD reported feeling so sad that they stopped doing some of their usual activities. Levels of depression and suicide among teens have been rising nationwide, according to many studies, and SDUHSD’s students, unfortunately, appear to be no exception. In 2017, there was the devastating fatal shooting of a Torrey Pines freshman who aimed a BB gun at police officers in what was deemed a suicidal act. Dill confirmed a second suicide of a district student, but due to the family’s request for privacy, no details were available. Next year the district will adopt several initiatives aimed at cultivating student wellness and connectedness. The middle schools will implement the Start with Hello initiative that addresses social isolation. Students will be taught ways to be inclusive at school, including how to reach out to others who may feel lonely and left out. The high schools will adopt the “Say Something initiative that teaches students ways to identify warning signs, particularly on social media, that someone could be a threat to others or himself/herself. The initiatives are part of the Sandy Hook Promise, a nonprofit founded by several family members of the victims killed at Sandy Hook Elementary School in 2012. Board members Joyce Dalessandro, Amy Herman and Maureen Muir did not respond to requests for comment. As of this writing, neither the audio nor the minutes from the May 10 board meeting had been posted to SDUHSD’s website. Total of 105 million from 134 million goes to salaries and benefits. These are public employees not private sector, why are their salaries and compensations 2-3 times higher? When the district had surplus they gave 12.5% raise instead of just giving bonuses? Is that makes any business sense? Not it does because it’s not sustainable. It would be explained if there is some conflict of interest between teacher union and the district? I assume there is something going that is not obvious. I recently read that a teacher by the name Bob Croft did not teach for 7 years but was working for the Teacher Union, yes? But he was getting paid by the district? Is that true? I think Marsha Sutton written that article. Is it legal? Not working for the district but getting paid by the district? Rather strange to me. I’m all for paying handsomely excellent teachers and highly competent administrators. But paying 2 to 3 times above market rates, should be questionable. Paying a teacher from district fund while employed by the Union, seems wrong. But I may not know all the laws and hidden policies behind the scenes. Maybe this is all kosher. But still seems wrong. What a sad state of affairs. Despite well-compensated (translation: excellent?) teachers and administration, it would seem that student suffer worse consequences in the form of poor statistics on mental health, ridiculously large class sizes and only 4 percent of the budget being allocated for student books and supplies. As federal and state taxpayers, we deserve better. Thank you for this informative article and please continue your investigations. It seems that everyone has an opinion on what teachers should do, what teachers should earn, and what teachers should teach. When a student fails, the teacher must not have worked hard enough. When a student is depressed or harms him/herself, the teacher must not have cared enough. Articles like this propagate the myth that teachers are the cause of our children’s problems and do not deserve the compensation associated with, say, a middle-management position. Consider this: Teachers are not the enemy – they simply care about their students and work hard every day to help each and every one succeed. Teachers interact with students daily, face-to-face, in ways that parents often can not or will not. Teachers endure near constant criticism and judgement from parents, administrators, and even their own students in an attempt to effectively do their jobs, yet they persist… with passion, effort, and integrity. They persist with the singular goal of helping as many children as possible in the time they have together. If everyone else can do better, maybe everyone else should go back to school, get their teaching credentials, and join in the worthwhile cause of educating the next generation.